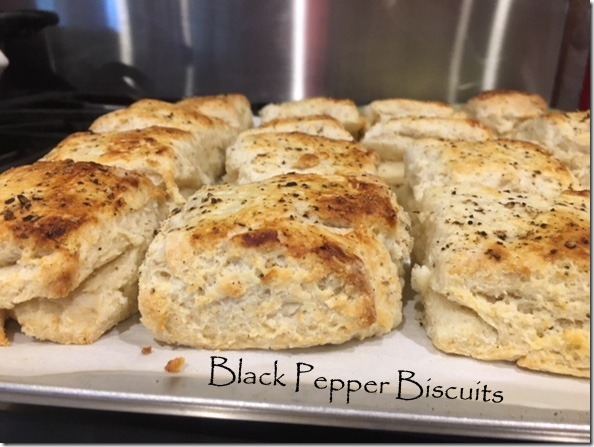 Posted in Breads, Brunch, on January 4th, 2018.
Who would think that just regular rich buttery biscuits could be so much better with the addition of pepper? 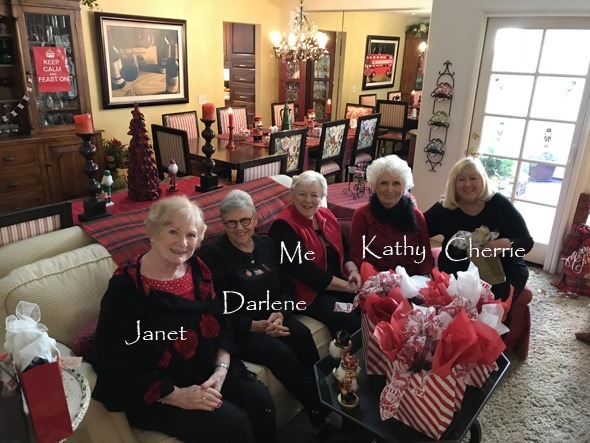 A few weeks ago a group of us got together for a breakfast at my friend Cherrie’s house. Some in the group have been meeting for about 35 years, others a shorter time. Usually, in December, one of us hosts the group for breakfast and we share Christmas gifts with one another. Cherrie made a lovely breakfast for us (a potato casserole, sausage and gravy – along with the biscuits I made – fresh fruit, OJ or Prosecco and OJ, and a cranberry coffeecake and coffee, of course). It was all sumptuous. There we are in Cherrie’s living room about to open our presents. She’s doing an Olde English Christmas this year (see one of the Queen’s adapted mottos at the left – it says “Keep Calm and Feast On” – and the London 2-decker bus back behind the table – it’s mounted on the mirrored wall, but looks like it’s in the frame). She has Scottish charger plates and runners and she’s been collecting Nutcrackers for years, though you can’t see any of them in the picture. Cherrie does a theme every Christmas – last year it was Hawaiian. And just as an aside. Kathy’s grandson, Zach, has just been accepted at the University of Hawaii with a FULL football scholarship. Their family is floating on Cloud 9. Zach was offered scholarships at 9 colleges or universities. Obviously he’s a star player! Back to the biscuits: since we meet early, I cheated and made the biscuits the night before and stuck them (raw) in the freezer, then popped them in Cherrie’s oven once I got there. The tops of the biscuits had been slathered with buttermilk, then black pepper sprinkled on top. 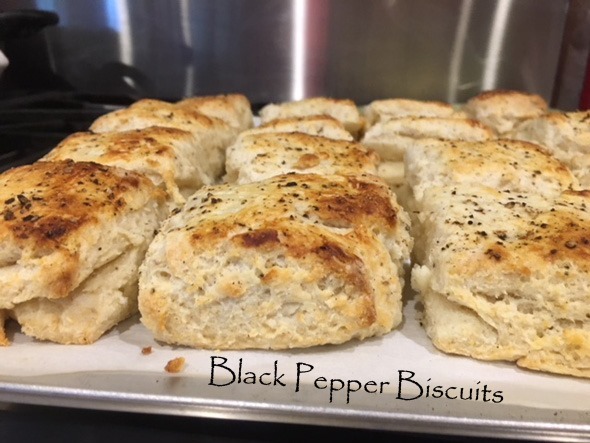 Black pepper biscuits are definitely a southern tradition, but I’d never had them (nor made them) before. The recipe is a fairly traditional rich (butter) biscuit but it has a bunch of fresh ground black pepper in the mixture, and then on top too. Photo below is before I baked them. IF I were to make these again, I wouldn’t freeze them – only because they didn’t brown evenly (see photo), but that was really not a problem with the taste, just the appearance. Or, the option would be to freeze them, but not slather the buttermilk and pepper on top until just before you bake them. The buttermilk had been absorbed by the biscuit dough, although the pepper certainly did stick well enough. There were raves around the table, mine included. You know, we here in the U.S. and Canada, and likely England as well, use black pepper as our tableside condiment. In many other countries, they use other things like spicy paprika in Hungary and other countries in that region. And in some South American countries they use a spicy dried pepper (not peppercorns). But for us, black pepper became the standard. And I certainly use a lot of it – did you also know that as we age, our taste buds lose their ability to taste as well, so it’s not uncommon for people to use more salt or pepper? I thought these biscuits were superlative! With the sausage gravy on top – oh my goodness was that ever good. Loved it. And yes, I’ll be making them again. What’s GOOD: the addition of black pepper does make the biscuit spicy/hot – use less if you’re sensitive to heat. It made a very different tasting biscuit, and it was well liked by everyone at the breakfast. Cherrie kept most of the leftover ones and is going to make sausage gravy again and serve it over those biscuits. What’s NOT: only if you don’t like black pepper . . . I thought these were scrumptious. 1. Preheat the oven to 450°F and line a baking sheet with parchment. In a large bowl, whisk the flour with the baking powder, salt, 1 1/2 teaspoons of pepper and baking soda. Scatter the cubed butter over the dry ingredients and, using your fingers, pinch the butter into the flour to form small sheets of butter, with some of the butter about the size of peas. Stir in the 2 cups of buttermilk just until a dry, shaggy dough forms. 2. Turn the dough out onto a work surface sprinkled lightly with flour and knead gently, folding the dough over itself 2 or 3 times to form a layered dough. Pat the dough out to a 1-inch-thick rectangle. Using a large, sharp knife, cut out as many 3-inch-square biscuits as you can. Gently press the scraps together and cut out more biscuits. [I used a 2 1/2″ square cutter, so this recipe made about 13 biscuits.] Biscuits may be frozen at this point, then sealed into a plastic bag. Use within 2 weeks. 3. Arrange the biscuits on the prepared baking sheet. 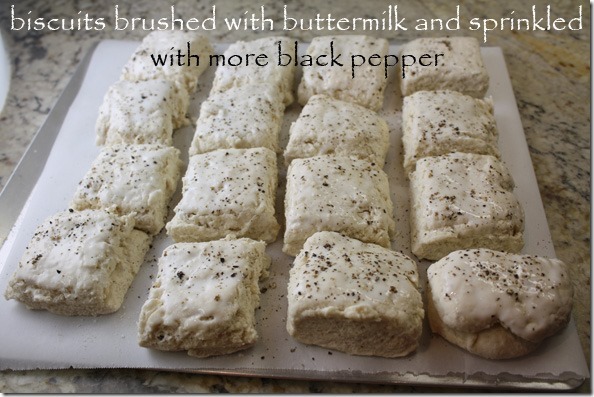 Brush the tops with buttermilk and sprinkle with coarsely ground black pepper. Bake for about 15-16 minutes, until golden brown. If baking them from a frozen state, still do the buttermilk brushing and added pepper just before baking, but the biscuits may take 2-3 more minutes to reach that golden brown. Per Serving: 432 Calories; 21g Fat (44.4% calories from fat); 9g Protein; 51g Carbohydrate; 2g Dietary Fiber; 56mg Cholesterol; 879mg Sodium. Black pepper makes me cough and cough. So does white pepper nowadays. . . Your company looks very well and the set up is very cosy. . . I think the Keep Calm thing was a Government admonishment in WWII rather than from the King of the time. I do love a flaky buttermilk biscuit. Have done black pepper cheddar ones before, and I agree that the pepper adds a lot. I think you are right about brushing the frozen ones with buttermilk right before baking instead of before freezing. I’ve tried freezing unbaked biscuits and scones many times and have had excellent results. There was a post on KAF about freezing scones before baking, and they found that they even got a higher rise by freezing them first. I have not noticed that myself, but they usually turn out great. In fact, I like to use a cream scone for shortcakes, and I will usually bake only enough for dessert and freeze the rest for future use, baking only as many as needed. They have always browned nicely. Your breakfast sounds decadent! And Cherrie’s place looks beautifully festive! of getting Cherrie’s recipe for sausage gravy to pair with these? Thank you–as always so enjoy your blog!